AWS WAF is a web application firewall that lets you monitor the HTTP and HTTPS requests that are forwarded to Amazon CloudFront or an Application Load Balancer. AWS WAF also lets you control access to your content. Count the requests that match the properties that you specify – When you want to allow or block requests based on new properties in web requests, you first can configure AWS WAF to count the requests that match those properties without allowing or blocking those requests. This lets you confirm that you didn’t accidentally configure AWS WAF to block all the traffic to your website. 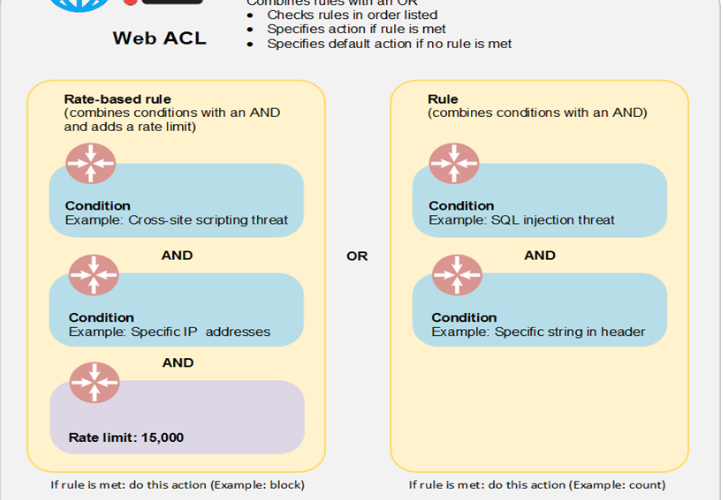 Rules that can allow, block or count web requests that meet the specified conditions. Alternatively,rules can block or count web requests that not only meet the specified conditions,but also exceed a specified number of requests in any 5-minute period. Scripts that are likely to be malicious. Attackers embed scripts that can exploit vulnerabilities in web applications. This is known as cross-site scripting. Country or geographical location that requests originate from. SQL code that is likely to be malicious. Attackers try to extract data from your database by embedding malicious SQL code in a web request. This is known as SQL injection. Strings that appear in the request, for example, values that appear in the User-Agent header or text strings that appear in the query string. Regular rules use only conditions to target specific requests. For example, based on recent requests that you’ve seen from an attacker. Rate-based rules are similar to regular rules, with one addition: a rate limit. Rate-based rules count the requests that arrive from a specified IP address every five minutes. The rule can trigger an action if the number of requests exceed the rate limit.